Councilmembers Christopher Smitherman (I) and Charlie Winburn (R) called a special city council hearing today to discuss the finances of the $110 million Cincinnati Streetcar project. The hearing had a specific focus on utility relocation agreements due to the current impasse between the City and Duke Energy. City officials stated unequivocally that the project will move forward, and that it is common for projects of this scale to have ongoing issues needing to be resolved even once ground has been broken. Both Mayor Mark Mallory and City Manager Milton Dohoney stated that an agreement will eventually be made with Duke Energy, but that the engineering disagreements between the two parties needs to be resolved first. 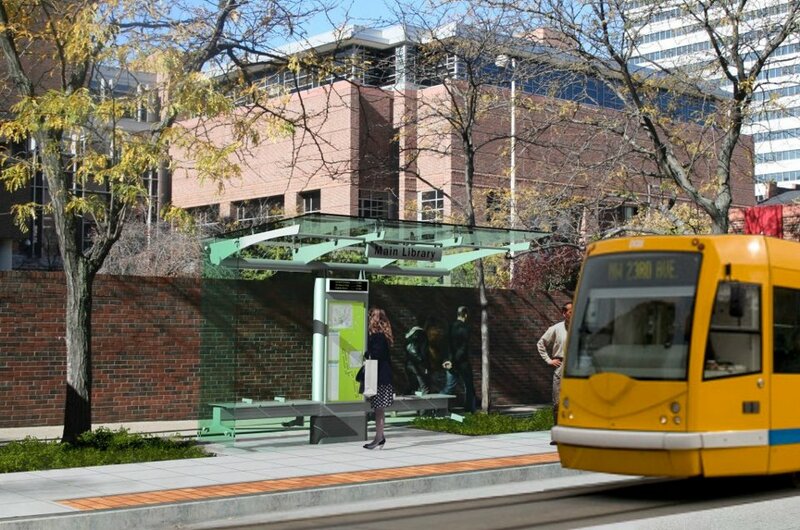 Rendering of the streetcar along Walnut Street in downtown Cincinnati. The biggest question at hand, with Duke Energy, is that the City has looked at existing streetcar projects around the United States and come up with a standoff they believe is workable. Duke Energy, meanwhile, has disagreed with those statements and believes that a much greater standoff is needed. Duke Energy estimates that the relocation work, based on their engineering, would cost approximately $18 million. The City, on the other hand, believes it should only cost $6 million based on the work of their engineers. At a press conference held earlier this week, City Manager Dohoney stated that City of Cincinnati should not be responsible for subsidizing the modernization of Duke Energy’s utility assets, and that the two parties will remain at an impasse until the engineering is validated. The big news came in the final statement of the meeting when Mayor Mallory announced the groundbreaking for the Cincinnati Streetcar will take place at 1pm on Friday, February 17 outside of Memorial Hall (map). Mayor Mallory also stated that city and project officials will be joined by the Secretary of Transportation Ray LaHood at the groundbreaking. Jenny Kessler and John Yung contributed to this story.